Say cheese! 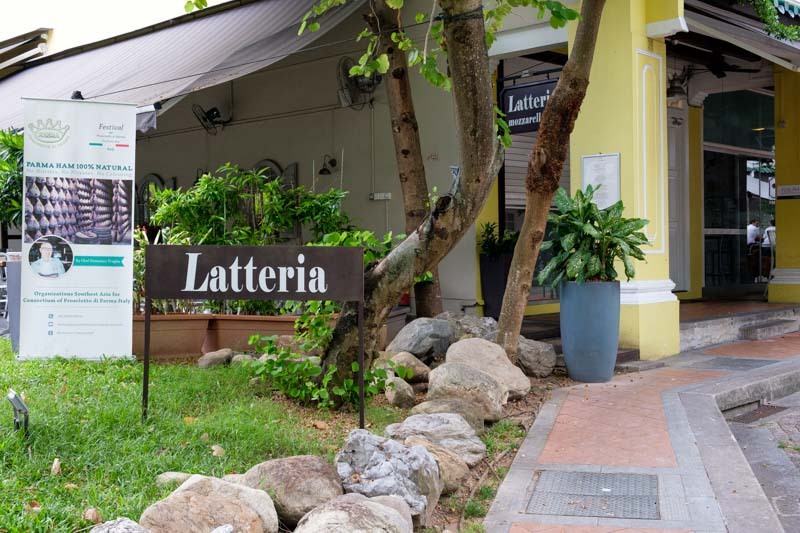 You’ll be saying that a lot, because Latteria Mozzarella Bar at Duxton Hill carries the widest range of mozzarella cheese in Singapore. Sitting along a quiet stretch of road, Latteria Mozzarella Bar isn’t too hard to spot, as the sign is displayed prominently at the entrance. You can also opt to dine al fresco. With 90 outdoor seats available, you should be able to secure a table easily. If you are a polar bear like me and would prefer to sit indoors to escape from the heat, the restaurant can hold around 50 customers at one go. The tables are huge, because communal sharing is encouraged here. To start the cheese rolling, we had the Bocconcini, Avocado & Olive Oil Cream ($22). These may be served as the starter, but do not let its size deceive you. The Bocconcini dish is basically made up of small mozzarella balls. The Bocconcini was smooth and chewy, with a slight sourness that was gentle on my palate. Due to its light flavour, I was able to smell the fragrance of the olive oil and the avocado. Chewing and swallowing these cheese balls was effortless! Gently presented atop a bed of pumpkin and greens, the Burratina Zucca, Roast Pumpkin & Truffle ($25) looked huge; the cheese actually weighed 125g. I was glad they served the burratina because it is smaller than its better-known brother, the burrata. It is a type of fresh Italian buffalo milk cheese made of mozzarella and cream. I could smell the all-too-familiar truffle aroma, and cutting into the burratina revealed a generous amount of cream that was very dense. The layer of mozzarella that enveloped the cream was slightly too thin. It would be perfect if the layer of cheese was thicker, as the flavour of the cream overpowered the cheese. I loved how the roasted pumpkin seeds and rocket gave the soft burratina an added crunchiness. Moving away from cheese, the Garlic Prawns, Chick Peas & Pesto ($20) was a welcome dish that brought a different set of flavours. Chickpeas and pesto form the gravy and it’s pan-fried together with the garlic prawns. As soon as I sank my teeth into the Garlic Prawns, the freshness of the seafood awoke my senses. The gritty chickpea and pesto sauce coated my tongue, harmoniously tantalising my taste buds. The sauce was seasoned with just the right amount of salt, allowing me to taste the sweetness of the fresh Garlic Prawns. The Seafood Spaghetti Mediterranea, Spicy Tomato Sauce ($35) was packed with clams, squids, prawns, and langoustine (a type of lobster). The spicy tomato sauce was thankfully not as spicy as I thought it would be. The clams were soft and tender, squids were chewy and juicy, prawns were fresh and sweet, and the langoustine was delightfully sweet. Each mouthful of well-cooked spaghetti was paired with different seafood, allowing me to enjoy the multitude of textures. The Roasted Red Snapper Fillet, Sauteed Tuscan Kale, Smoked Peppers Puttanesca Sauce ($38), however, was rather ordinary. The Red Snapper was fresh, tender and juicy. The Italian sweet puttanesca sauce had a slight herbal taste and had tomatoes, olives, and capsicums added into it. While this dish was well-prepared, the flavours were predictable; I already had the taste and texture of the Red Snapper in my mind before I even tasted it. The Slow Roasted Lamb Shanks, Chickpeas & Red Wine Casserole ($38) on the other hand tasted phenomenal. A side note: if you’re not a fan of lamb, this meaty dish might not suit you. But for a lamb lover like me, this was simply heaven. The Lamb Shank was so soft that not much effort was needed to remove the meat from the bone. If you love the creaminess of lamb fats, you’re in for a treat. The fats of the Lamb Shanks simply dissolved in my mouth. The sweetness of the sauce also blended well with the Lamb Shank, neutralising the gamey taste. We ended off the meal with a few desserts. The Tipsy Tiramisu Cup ($16) was the first contender. The first thing that hit me was the bitterness of the cocoa powder. Luckily, the cream cushioned the blow. I could taste the alcohol right away, though it wasn’t too overpowering. However, I couldn’t really taste the coffee flavour, as it tasted primarily of cocoa, alcohol, and cream instead. The Raspberry & Pistachio Meringue Cake ($16) ended our meal on a sweet note. The Meringue melted slowly in my mouth, teasing my sweet tooth as it slowly dissolved. While I’m a dessert fan, I prefer my desserts to be less sweet, and this one hit the spot. I’d definitely want to visit Latteria Mozzarella Bar again. From the starters, to the mains, and finally to the dessert, I was absolutely stuffed with good food. Now that’s contentment!